Tic Tac is one of the hottest african musician to come out of ghana.He has over 11 music awards and 6 albums to his credit He became the first african artiste to feature in the MTV Base " making of the video"and had his video directed alongside Akon by Gil Green (U.S director of videos for 50 cent, Brandy and Buster Rhymes). His song "Kangaroo" spent over 4 weeks on the MTV Base chart No'1 spot and he ...was the first Ghanaian musician to perform at the 2007 Big Brother Africa in South Africa to an audience of over 50 million viewers across Africa. In 2008,he was ambassador for peace keeping representing west africa at the Not In Our LIfetime Concert in South Africa against the Xenophobic Attacks. He is involved in compaigns with the United Nation in Sierra Leone and Ghana alongside Ramsey Noah and Oswald Boateng, as part of the WFP raising funds for children. He became the first hip life artiste to collaborate with anyone outside of ghana with meiway of ivory Coast "wope" and Nigerian Star Tony Tetuila on the explosive "Fefe Na Efe" which received several awards around the world. Tic Tac's vision is to educate people through his music and help bring awareness of major issues in Africa like poverty,diseases, malnutrition, conflicts and to promote youth empowerment and self-employment. 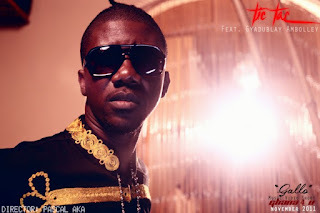 Now he his back with two brand new videos/songs from "Tic Tac" of Ghana, titled "Feel The Heat and "In The Gallo". The videos are from his upcoming album "Ghana 4 U".